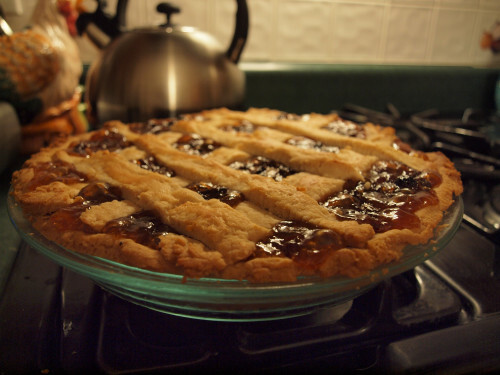 When I came home from college for winter break, my Dad requested that I bake him a raisin pie, also known as “funeral pie.” A favorite of Old Order Mennonites and the Amish, raisin pies were traditionally baked for funerals due to the availability of ingredients on short notice and its ability to keep well for several days at room temperature. Once again I decided to attempt a homemade crust, using a 3-2-1 ratio recipe. Unfortunately, I must have added far too much shortening (a half butter, half shortening crust for a balance between flavor and flakiness), as the dough was extremely sticky, not pea sized crumbles of fat. So I added another quarter cup of flour, and then another… and another, until the consistency felt correct. Next, I made the filling. In essence raisin pie filling is corn starch for thickness, water, sugar, lemon juice and raisins, lots and lots of raisins. As the raisins bubbled away, I grew skeptical of this pie. Raisins come in the little red Sun-Maid boxes, not in pie; I could not imagine that this pie would be any good at all. Soon the filling had thickened up nicely, smooth sailing there, but as I tried to roll out the chilled pie dough, it kept flaking and sticking to the rolling pin. I did manage to get a layer down, but it was slightly too thick to leave enough for the roof. Making the best of things, I made a lattice top instead. I washed my hands and left the raisin pie fly free to the baking deities, hoping that it would be edible. Upon first bite I immediately noticed the consistency, very much like pecan pie. That would make sense, considering the sugar content from the actual sugar and the raisins themselves, along with the cornstarch as a thickener. Then I got a mouthful of raisins, bursting with a high concentration of sugar. I will profess, I instantly did not like raisin pie; it was incredibly sweet, like eating raisins with sugar syrup on them. A few bites in though, I started to get the tartness of the lemon juice and I began to warm up to the flavor of densely packed raisins. 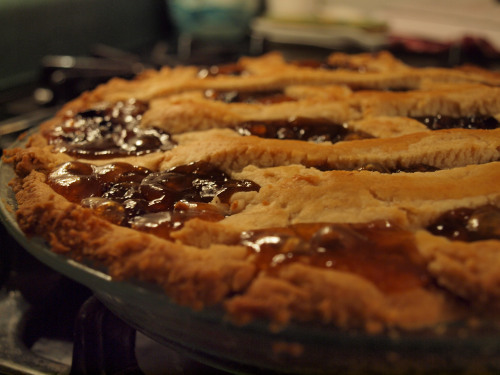 Especially combined with the crumbly pie crust, the interplay of texture between sticky filling, tender raisins (not tough at all after stewing and baking for over an hour), and crust made for an enjoyable piece of pie. If one can get past the immediate sweetness, one should definitely enjoy a “funeral pie,” a pie much too sweet to be found at such a mournful occasion. Honestly, raisin pie was quick and easy, a recipe I would definitely recommend to bakers prone to experimentation with more unconventional ingredients. Pics or it Didn't Happen: Strawberry PieIn "Food"
Chess Pie and a Sugar ComaIn "Food"
Filed under Food, Miscellaneous, pie, Uncategorized, Zach B.